At the Albany Apartments, we understand that staying at a run of the mill hotel isn't for everyone. Our self catering apartments provide an affordable alternative and let you enjoy home cooked family meals and spacious comfort. 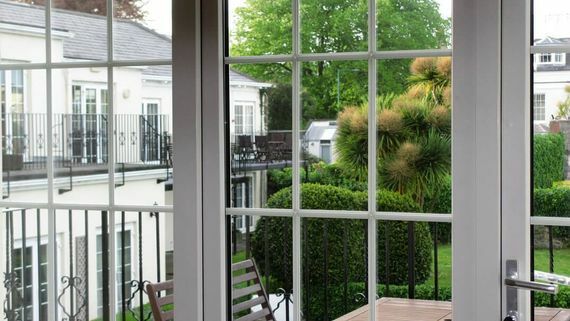 Centrally located in Guernsey our four star apartments are fully quipped providing a stress free holiday with the comforts of home. Named for their excellent view of St. Joseph’s Church designed by Augustus Welby Pugin best known for his designs of Big Ben and the interiors of the Houses of Parliament. For more information about Guernsey's cultural and leisure activities check out our 'Things to Do' page. Each of our self-catering ground floor apartments are accessed from a walkway and steps or from a double ramp. The front door opens to an entrance hallway that leads to a large eat-in kitchen, lounge, master bedroom, twin bedroom and bathroom (bath/shower combo except No. 15 which has a large walk-in shower). French doors from the lounge provide easy access into the gardens and pool area. Our two bedroom self-catering first floor apartments are accessed from the walkway and short flight of stairs to the front door. The main floor consists of an entrance hallway, cloakroom, kitchen, and combo lounge and dining area with French doors to balcony overlooking pool and gardens. Stairs lead to the master bedroom, bathroom (bath/shower combo), and twin bedroom. These apartments are accessed at the front of the property via seven steps or ramp. This apartment offers direct access to gardens and pool, features a compact lounge ,dinning area , seperate kitchen and a double ensuite bedroom. This apartment offers direct access to gardens and pool through French doors from the lounge and spacious dinning area, seperate small galley type kitchen, double bedroom and triple bedroom (single plus bunkbeds). Full bathroom with bath/shower combo. Spacious open plan area with combined kitchen, lounge, dinning area and double bed. Full bathroom with bath/shower combo. Entrance hall leads to a spacious open plan kitchen, lounge and dinning area. Double ensuite (shower only) Note this is an interior courtyard apartment, Pool and garden accessed via the main house. click Book Now for availability or Contact us on 01481 712 392. The Albany Apartments - your home away from home!